A skunk's fur is black with a white stripe that begins as a triangular shape on the top of the head, forks into two stripes that travel down the sides of the back, and usually merges again near the base of the tail. Another white stripe runs from the base of the snout between the eyes and ends on the forehead. All skunks eat a wide variety of foods including insects, small mammals, seeds, carrion, fruits, and other vegetation. The skunk is about the size of a domestic cat, with a small head, small ears, short legs, and a long, fluffy tail. Feet are plantigrade with five partially webbed toes. Claws are longer on the front feet to help in digging. Body length: 13 - 18"; weight 6  14 lbs. Close relatives include ferrets, otters, and badgers. Like all skunks, they are rarely active. This species is one of our most widespread and common mammals, occurring throughout the US, Canada, and Mexico. All skunks eat a wide variety of foods including insects, small mammals, seeds, carrion, fruits, and other vegetation. Due to the great diversity of habitats in the deserts, all four species of skunks are present. They like open areas with a mixture of habitats and live in a variety of areas from riparian canyons to wooded areas. They prefer thick, brushy areas. They are mostly silent, but do make a range of sounds such as churring, hisses, and screams. They have good hearing, but their vision is poor. 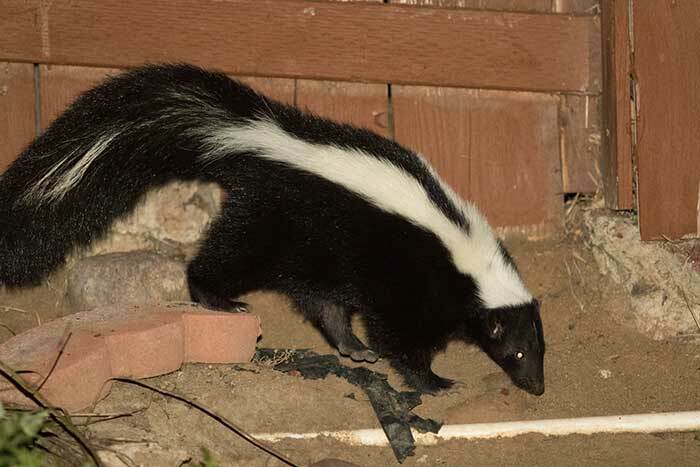 Striped skunks spray their scent as a defense against predation and molestation. The offensive odor is caused by a sulfur-containing compound called mercaptan, which is closely related to the scents added to natural gas to enable detection of leaks. 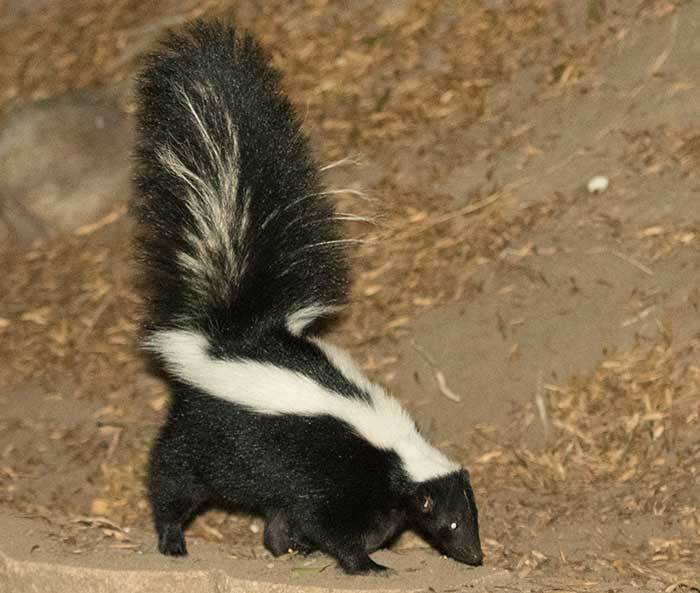 Skunks give plenty of warning of their intent to spray. Skunks usually have enough fluid for 5 or 6 volleys of spray, which they can shoot up to about 12 feet. Tomato juice neutralizes mercaptan, and will help to remove the smell of skunk from clothes, hair, or dog fur. Males are polygamous and solitary. Ther do not associate with the females beyond the few days required for fertilization. Mating takes place from mid-February until mid-March. The gestation period is between 60 and 77 days. Male skunks provide no parental care. The baby striped skunks at birth are blind, deaf, and immature. They nurse for about a month and a half in the mother's den. They stay with the mother until they are about 1 year old. They survive in the wild for around 3 years. In captivity they will live much longer. The only predator skunks have is the great horned owl, which has almost no sense of smell. Their poor eyesight also make them a frequent victim of the automobile.